Referees are an integral part of the game. They use their judgment and knowledge of the sport to give both teams an equal opportunity to compete based on individual skill and teamwork. They enforce the rules and provide the younger players with real time instruction. 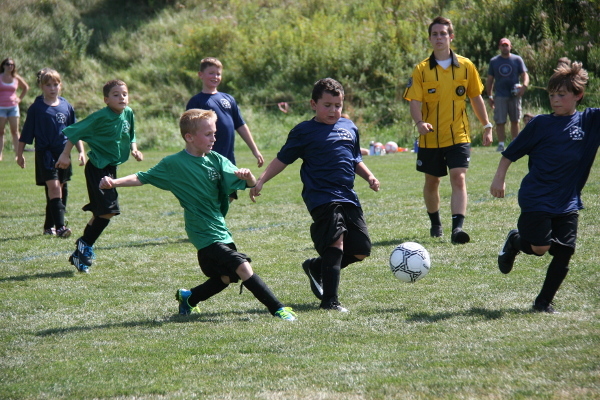 For older players the referees control the tempo of the game and promote good sportsmanship. At LSC-Rec Express, we look for referees who fully understand the rules of soccer and know how to use that knowledge to create a fair and fun game for all. Thinking About Becoming a Soccer Referee? You must be at least 12 years old and certified as "Grade 8" by the U.S. Soccer Federation. For more information about training, please visit the NH Referee. Already Certified and Looking for Work? Make sure your certification is current. If not visit the NH Referee for information on re-certification. If your certification is up to date, please update your profile in your GameOfficials.net settings to include LYSA as one of your leagues. If you are unsure on how to do this, E-mail Frank Scarito and request that he add your name to the list of our preferred referees. What are the Responsibilities of a LYSA Referee? Dress the Part. Wear a clean referee shirt with the certification patch clearly visible. Flags and whistle in good working order. Act the Part. Arrive on time. Treat players and coaches with courtesy and respect - even when they disagree with you. Finish the Job. Get accurate scores and report to referee coordinator. Report any injuries and/or cards as soon as possible.